Here is a high tempo drill to add to your bank of flow drills. This is a good hockey drill for bantams, midgets, junior, and even college level players. It is an ideal drill for a flow type of practice. To set it up, place pucks in opposite corners of the ice and have two lines of players at center ice facing the nets. To start the drill place one player (P1) in the corner with a puck. On the whistle the player carries the puck up ice inline with the dots. The first player in line (P2) swings through the slot to receive a chip pass from P1. P1 should time their swing so they are skating into the puck and receiving it just outside the blue line. The second player in line (P3) swings through the neutral zone to receive a second chip from P2. After P2 chips the puck to P3 they drive hard to the net. 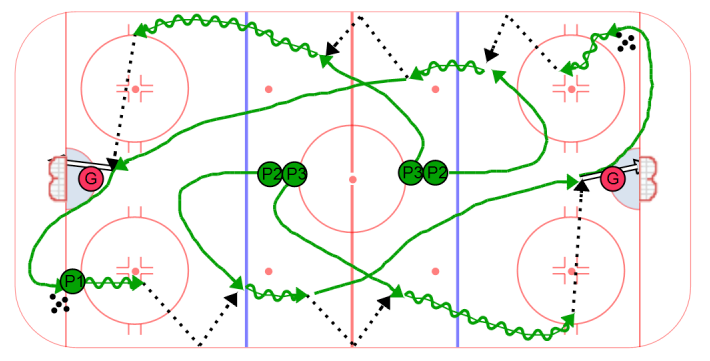 When P3 receives the chip from P2 they attack the zone wide, delay if needed, and make a hard pass to P2 as they drive the net. After the play on net P2 skates into the corner to get a puck and start the next repetition.